MINT Gym + Nutrition | What is Intermittent Fasting? We are constantly being asked about intermittent fasting, a dietary approach that is very popular at the moment. Firstly, fasting is something that has been around for centuries. It is one of the most ancient forms of healing and fasting has been used by a number of different cultures since the dawn of time. Most commonly related with spiritual practices, it is often associated with the Islamic faith where Ramadan is observed for one calendar month of the year. This is when daytime fasting is practiced between sunrise and sunset. In ancient times fasting was used by Hippocrates (known as the father of modern medicine) as a form of healing, and has been quoted as saying “to eat when you are sick is to feed the illness”. Research now shows that fasting has positive health outcomes and may reduce the risk of many common diseases. But I think of fasting as something that we do (okay on a smaller scale) every day. My quote at home is “who is ready to break ye fast? !” (cue kids eye rolling!). Every night while we are sleeping we fast. Ideally if we have had an early enough dinner and not eaten after (yes including those sneaky sweet treats!) we should technically be getting a good number of fasting hours. The eat:stop:eat method – do a 24 hour fast once or twice a week. As you can see the approach is aimed towards calorie restriction in some way, but this does not mean IF is only geared towards weight loss. It also has huge benefits for insulin resistance and blood sugar regulation, cholesterol profile, immune system, brain clarity and function as well as anti-ageing benefits. You would think that by not eating that it may impact upon physical performance. However, research has shown that those who carried out fasting during spiritual periods including performance athletes were not actually affected by fasting. One of the reasons behind this could be due to our natural stress system. During the day when we are active our bodies are naturally in sympathetic nervous system dominance. We produce stress hormones to get us through the day (ideally not too much though…but that is an article for another day). During this state our body is designed to promote blood flow to our most important organs such as the heart, brain and muscles. It is the “flight or fight” response and our digestive system is naturally reduced in this state allowing the sole focus to be on protecting these vital organs. Often people who are in a heightened state of stress during the day complain of poor digestion – funny tummy stuff – and this could be due the fact that stress and digestion just don’t work together! When we are in the parasympathetic nervous system dominance we are in the state that is perfect for digestion. We are at what is also commonly known as the “rest and digest” state where our energy is conserved, our immune system function increases, our digestive system function increases which allows us to absorb our food more efficiently. So as you can see we can actually support these two stress systems through fasting during our waking hours. Which is why some people say they feel more switched on, with greater clarity. Especially if they are re-fuelling with whole foods that are packed with nutrients! Just remember as with ANY kind of nutritional approach, it is not a one size fits all, so yes IF seems to suit just about anyone! But some people may really struggle to keep up this style of eating. I always say to new clients that any approach to nutrition needs to be long term and sustainable. Don’t be alarmed if you struggle to “stay on track”. You may fall off the bandwagon, its about finding the motivation to get back on – and with the amazing list of health benefits IF presents with, it may really be worth it! If all else fails, try this approach once a month to begin with. Fast for less hours as your initial approach to see if you can stick with it. Working with someone else who will fast with you or checking in with someone that you are accountable to can also be really helpful to keep you motivated. So you have decided to give it crack now how is it all going to work? Firstly you need to be prepared. 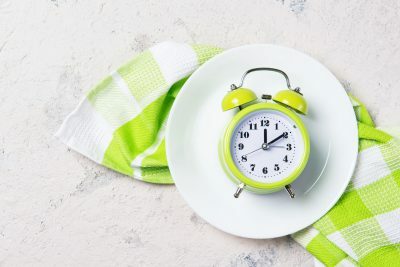 Understand which approach you want to try whether it be the 16:8 method or my favourite the super fasting approach and then see what time you are going to have your meals. Think about how that first meal is going to look when you are ready to break the fast. It should consist of a good amount of protein and healthy dietary fats with some super nutritious carbs in the form of brightly coloured vegetables. Throw in some herbs and spices and you are going to give yourself a jam packed nutritious meal which your body is going to love you for. You should definitely hydrate during the fast. Filtered water is of course a must but if you want to add in some extra detoxifying nutrients sip away on some good quality organic herbal teas. Suggestions are; milk thistle, dandelion root, peppermint, nettle or fennel are just some examples. Some people drink black coffee (sorry no flat whites!! ), be careful not to overdo it as caffeine can dehydrate you, so something to be mindful of. If you want to try intermittent fasting but would like a bit of guidance initially? Why not book in a consultation with one of our Clinical Nutritionists in the Mint Nutrition Clinic? hello@mintfit.co.nz; We can help you with the initial planning and make sure you have considered everything that is involved with IF.